It’s rather unfortunate that Apple exercises as much control and as many restrictions as humanly possible throughout iOS, and is one of the main reasons why people wind up jailbreaking the device. Currently, the only things that can be attached via email on the iPhone, iPad and iPod touch are images and video clips from stock photo album along with a few other very minor things such as business cards. Luckily, there is a small tweak available which will let you share any file residing on your phone including any documents, videos and audio files. 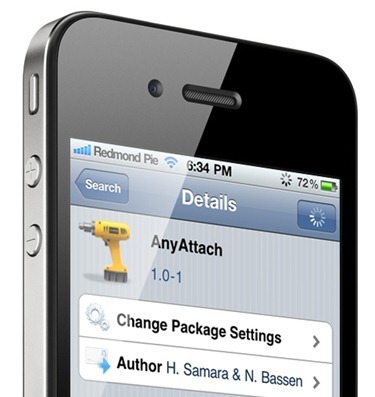 AnyAttach, which comes with a price tag of $1.99 at the BigBoss repo, integrates seamlessly with the Mail client. Just install, respring, and tap the paperclip icon in your Mail app to add any attachment. There are a few settings which are changed in the Settings app, and as such there is no SpringBoard icon. There is a lot of speculation regarding the status of jailbreaking when iOS 5 eventually drops. Some say that because of the many, many amendments made by Apple regarding many consumer gripes within the software, that actually jailbreaking will not really be necessary. In addition, it will probably take a while to achieve an untethered jailbreak, if at all. The wizkid known as Comex was the first one to expose the security flaws in the iPad 2, and that took months. Now he works for the Cupertino-based company, which has severely upped its game in its efforts to unhinge the hacking community. That community now faces its most stringent test so far. For although it is great that Apple is making some long-awaited improvements, many of the tweaks available just will never happen – AnyAttach being a prime example. It also has a now tiresome habit of making significant “oversights” and then bringing them through on the next device. As such, the jailbreak is very necessary in order to keep the iExperience as tailored as possible. In order to add any attachment you like to your iOS emails, you need a jailbroken iPhone or iPad. You can follow our step by step guide posted here to jailbreak your iPhone, iPad or iPod touch on iOS 4.3.5 using Redsn0w (or PwnageTool), or on iOS 4.3.3 using Redsn0w, PwnageTool, Sn0wbreeze & JailbreakMe (that last one being the easiest).